Matilda and I continued our tradition of attending a ballet performance of the Nutcracker each holiday season. One of her best friends joined us again this year. This particular friend is moving away next month so we are trying to cram in lots of fun adventures before she goes. The girls were thrilled to meet Clara in the lobby. Between the tiara, make-up, fancy pointe shoes and gorgeous costume, Matilda was just about paralyzed in her presence and could barely muster a hello. 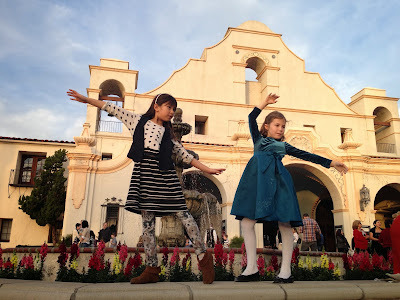 After the performance they did A LOT of ballet-esque moves around the fountain courtyard and debated heavily their favorite characters and favorite costumes. Porter has never joined us yet, since the ballet is a bit long. To help avoid any hard feelings, Tim took him out to see Frozen while we were at the ballet - a perfect consolation prize.